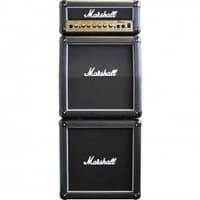 2011 may well be remembered by guitar and amp aficionados as the Year of the Micro. On top of the list of big things that come in small packages is the EVH 5150 III Micro, a tube-driven head that delivers smashing power to your favorite cabinet (or, better yet, Eddie Van Halen’s favorite cabinet). Hauling your amp from home to the bar, or from home to the studio, and back again has never been easier. It has also never sounded so good. For those who want to jump on the micro-bandwagon, but who still want to be able to make their next mortgage payment, the Carvin V3M Micro may fit nicely into their plans. (Why not? It’s the size of a carry-on bag. How much less could you want?) Using the same electronic platform as the popular Carvin V3L head, the V3M Micro has been winnowed down to just 19 lbs., and can be rack-mounted for those who plan on keeping it in the same place for a while. 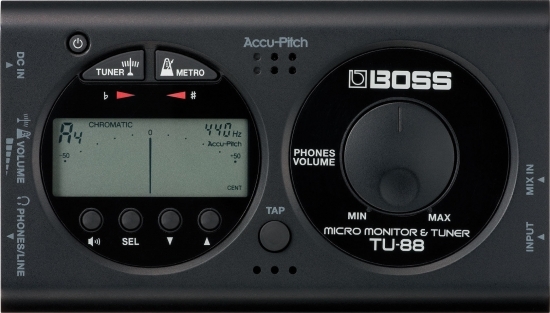 It’s guaranteed to free up valuable space in those often-cramped practice rooms and studios. Its exterior casing is metallic, with internal LED back-lighting (your choice of red or blue), which is attractive and different, but it’s what goes on inside that head of theirs that has the folks at Carvin looking so confident these days. Each channel offers the usual Treble/Mid/Bass controls, and also allows you to adjust the Presence and Drive (along with Volume, of course). Throw in digital reverb – another way of reducing the amp’s size and weight – and the V3M will suffice as a number of amps which you may no longer need anymore. The flexibility of 3 channels (with 7-watt, 22-watt or 50-watt output) allows the user to play most anywhere, from the most intimate of settings on up to auditoriums, depending on the cabinet. Knowing that the V3M would be sought after as a micro-combo, they offer a 112 version (with a single 12-inch speaker). Weighing just 36 lbs., this apartment- or dorm-friendly amp comes in a number of different “skins”, including Python Snakeskin, Vintage Tweed, White Bronco and Red Jungle Bark. 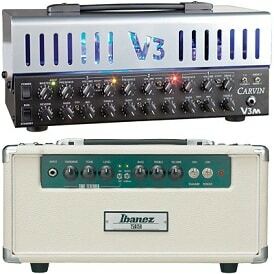 Knowing what they know about you, Carvin is also offering a variety of V3M Micro “Stacks”. The V3M112 combines the V3M head with the new 112V 1×12 cabinet and the V3M212 uses the new 212V 2×12 cabinet. Both the 112V and 212V are built to be used in a open-back or closed-back configuration. The V3M412 combines the V3M Micro head with their well-known and long-trusted 412VT. Whether you want your amp to sound like an old Standel or a new Marshall, the V3M series stacks offer a range of options that few of Carvin’s rivals would care to match. Ah, but they will try, especially if the micro trend continues and the units start moving quickly from the factories to the stores to the trunks of the customers’ cars, as they should; the Carvin V3M is practically a steal at $599. Ibanez, another venerable player in the world of amplified music, will be fighting both EVH and (to a greater degree) Carvin for market share. They were careful not to bring a knife to the proverbial gunfight, introducing their own versatile and powerful Micro tube amp, the Tube Screamer Series TSA15H Head and TSA112C (1×12) Half Stack cabinet. 15 watts of output may not sound like much – barely enough to round out a practice session – until you realize that the cabinet speaker is pushing out 80 watts. The built-in Tube Screamer circuit pours the sound out of the 12-inch Celestion speaker, backed by a set of four tubes that provide the after-burners. It can also run “quiet”, with a 5-watt channel as well. Durable and powerful, the Ibanez TSA Micro Stack will produce warm sound for a long time. Compared to other micros, the Ibanez may seem like a step down, but consider that the Ibanez only costs around $500… And is very attractive… And is about the only amp with a built-in Tube Screamer. Some say it isn’t piercing enough on the bright side, that it has a muddiness that won’t go away, and they decry the fact that it lacks a direct-out line. If fits the budget, though, and is an excellent option for those shows that take place inside of the confines of a building smaller than the Pontiac Silverdome. Micros are only going to get better – if not less expensive – as time goes by. Technology is always going to trend toward the nano, and these compact, tube-driven options are sure to push some of the more popular solid-state amps out of the market. (Are you listening, Line 6?) 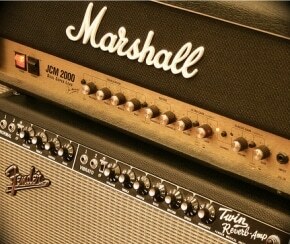 Today’s micro amps are also the point at which the past (tubes) and the future (digital control) collide. Most musicians would agree: It’s an evolutionary leap that is long overdue. The amp is switchable; user can choose 5 watts or 15 watts. The cabinet speaker may be RATED at 80 watts (I assume that’s RMS and not peak) but that is simply a CAPACITY; it does not mean that the speaker is pushing out 80 watts….unless of of course you connect some other amp to it that puts out 80 watts. Reading it over again, I am also perplexed. Mea culpa. You’re absolutely right. Your point illustrates why the Ibanez amp is a little bit behind its fellow tube micros, which are delivering more along the lines of 50 watts. Thanks for the spot-on input. I don’t think that the Ibanez necessarily gets left behind completely; depends on what you need and can afford. The V3M has many more features and is a true 3 channel amp. With regard to volume; a good rule of thumb regarding amp power rate vs. “loudness” is that you must double output power in order gain 3 dB. So if you were to do a test and run these heads into identical cabinet, the V3M should have a bit more to give, but the Ibanez should still be competitive for many applications (assuming that you like the sounds that it is capable of producing). It may be also worth pointing out that while at the time of the writing the price for the V3M head may have been $599,it is now (5/27/11) listed at the Carvin site as $799 direct price with $100 rebate = $699. The street price of the Ibanez head, without cabinet is about $299. Happy shopping! Yeah, I guess that’d be the difference between a “house amp” and an “apartment amp”. Thanks again for the insight.